Don’t Let Discolored Teeth Darken Your Smile. 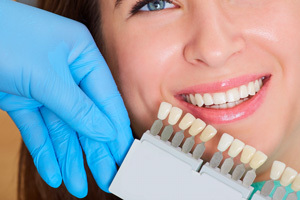 There’s really no reason these days to put up with discolored teeth any longer! While there are many over-the-counter teeth whitening kits out there, in order to achieve significant, lasting effects, you need the professional-strength treatments only a dental office can provide. What professional teeth-whitening options do you offer? A quicker, stronger form of over-the-counter whitening kits. A hydrogen peroxide gel substance is applied to your teeth and a laser light activates the gel. This procedure takes between 30 and 45 minutes and sometimes requires follow-up visits. Your dentist can create a customized tray and provide you with professional strength teeth bleaching gel to whiten your teeth gradually at home. The teeth bleaching trays are typically worn for several hours a day or overnight for the best results. At home teeth whitening can also be combined with an in-office whitening procedure for maximum results. No teeth whitening solution is permanent. You must be careful to avoid dark foods and beverages, practice good dental hygiene, and consider repeating whitening treatments to maintain a bright, white smile. In addition, certain severe tooth discolorations may not respond effectively to the gels, and are better suited for restorative procedures such as veneers and dental crowns to whiten teeth. Talk to your dentist for the best recommendations to suit your individual needs and lifestyle.